To deactivate a Parallels Mac Management for Microsoft SCCM proxy server, log in to your Parallels account. 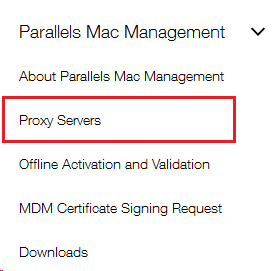 Open the Parallels Mac Management menu and go to the Proxy Servers page. You will see the list of the proxy servers. Select the one you need to deactivate, click on Actions and then Deactivate selected. Now you can use your license key for activating another Parallels Mac Management proxy server.